Over the past couple of weeks, Ubisoft has been gradually dispensing details on Rainbow Six Siege’s latest season, Operation Grim Sky, but now they’ve fully pulled the curtain back. The publisher has released a meaty gameplay video showing new Operators Clash and Maverick in action, as well as full Grim Sky patch notes. 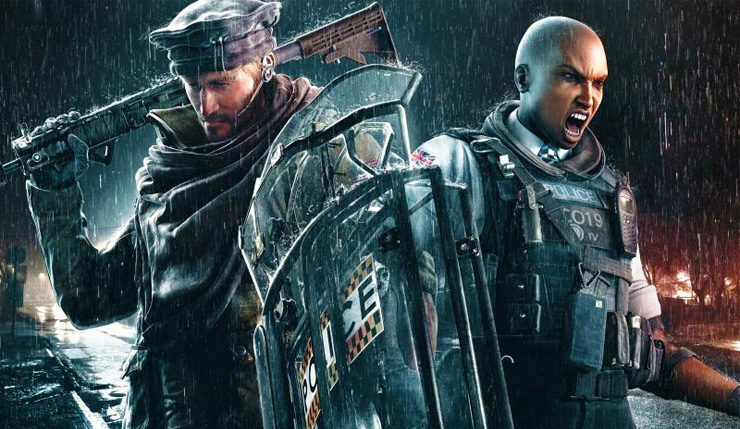 Check out the new Rainbow Six Siege Operators doing their thing, below. No matter how cold it gets, Frost has a way of welcoming people. She’s also the best at doing so with a spring loaded trap. No matter the weather, we’re celebrating this JTF2 specialist with a cool elite set. 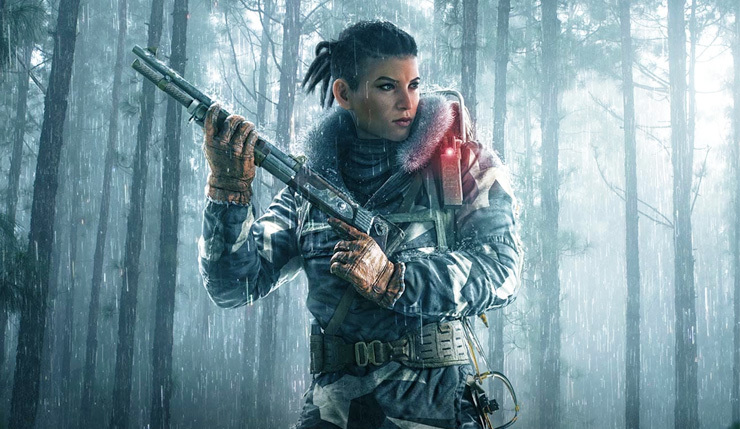 Elite Frost is ready to face polar climates with her Huntress uniform, victory animation, gadget skin for her Sterling MK2 LHT, and weapon skin for the Super 90, 9mm C1 and MK1 9mm. She’ll also have the Elite Frost Chibi charm. The aim of this Hereford Base Map Rework is to address issues pertaining to the map’s flow, balancing, and visual thematic to make the new Hereford Base viable for competitive play. Each floor of the new Hereford Base will have a larger surface area, which also means more destructible floors and walls. New stairs and hatches will be available, allowing for more movement between each floor and increasing the viability of rotations. The sky may look grim but things are looking up on Consulate. The Development Team dusted off some old blueprints and sought ways to improve this Rainbow Six Siege map, taking into account both the Attackers’ and Defenders’ perspectives. The Police Line spawn point will be extended, offering a safer path to the fortified building. As for the Gas Station spawn point, a wall will be moved to prevent spawn peeking and early kills. We’ve also added a fourth bomb site in Tellers and Archives. Time to revise those strats. Thatcher – EMP Grenades will now temporarily disable cameras instead of destroying them. Twitch – Shock Drone will emit slightly more noise. Hatch Reinforcement Changes – Hatch Reinforcements will now allow for partial destruction. Our goal is to deliver less binary destruction for hatches. We have made improvements to how Hatch Reinforcements are handled within the game, and are able to work around some of the blockers that prevented partial destruction from being possible. Idle Operator Pick – If you are not able to select an Operator before the end of the selection phase, you will no longer be a Recruit. You will be a random Operator from the list of Operators you have unlocked, barring any already selected by your teammates. Improved Mute Functions – We are implementing additional muting functions to allow our players to take more control of their Rainbow Six Siege experience. Players will now be able to mute each player in the game individually. For example, you can mute the text chat of Emilien, the voice chat of Grabriel, text and voice for Craig, and neither for Amelie. Dynamic Resolution Scaling – We are introducing dynamic resolution on consoles. The goal is to improve image quality when the GPU load is lighter, and render better framerate in GPU-heavy scenes. As a result, you will experience more consistent performance during gameplay, especially in situations where there are a lot of stress on the GPU, such as with a lot of explosions like Fuze charges. Xbox One outputs at 900p with a render scaling between 40% (1012×572) and 80% (1432×804). PS4 outputs at 1080p with a render scaling between 40% (1216×684) and 80% (1720×968). Xbox One X outputs at 1728p with a render scaling between 40% (1944×1092) and 100% (3072×1728). PS4 Pro outputs at 1440p with a render scaling between 40% (1620×912) and 100% (2560×1440). Map Rotation – With the addition of the reworked Hereford Base map, we will be updating the Ranked and Casual playlists. We will have 12 maps in the Ranked rotation, and 18 in the Casual playlist. All maps will be available in Custom Games. Ranked maps include Bank, Clubhouse, Oregon, Kafe, Consulate, Chalet, Border, Coastline, Theme Park, Villa, and Hereford Base. The Grim Sky update also includes the usual list of bug fixes – you can get the lowdown on every minor tweak and fix, right here. Rainbow Six Siege is available on PC, Xbox One, and PS4. Operation Grim Sky is currently limited to test servers, with full launch scheduled for sometime in September.